Creative people need solitude, lack of distraction, and unadulterated concentration. Ted Reynolds was born in Dover, New Hampshire, where he spent most of his early life, on March 11, 1928. After attending Dover High School he moved to New York City in order to pursue his career as an artist. During these years Reynolds not only developed his signature style of painting but studied other artistic media as well. Through his studies at Parsons School of Design, Rhode Island School of Design, and Arts Student League in Fashion, Reynolds became involved in a variety of projects. At the Parson School of Design, he studied fashion illustration, which later led to his involvement as Head of Design for menswear company Taylor Ties. While living in New York City, he was hired for a variety of jobs, ranging from designing showcases and displays for the Rockefeller Center to creating animated drawings for television commercials. In 1966, Reynolds returned to Dover from New York City and managed and maintained an art gallery in Portsmouth. During this time he worked as a freelance artist, while also teaching private lessons in painting and watercolor to community members. Reynold’s talents ranged across many artistic disciplines but he is most remembered for his paintings and portraits. His art is displayed not only across the United States but in several private European collections as well. During his time as a freelance artist he was a favorite of Sarah Lee, president of the Tom Lee, Ltd., one of New York’s top interior design companies. She was considered to have designed more New York hotel properties than anyone else in the business, where many of Reynolds pieces were commissioned and hung. One of his most notable projects in New York City was for the Helmsley Palace Hotel, where he painted 45 portraits in three months. These portraits were those of guests who might have visited the hotel in 1890, calling on Reynolds talent in historical stylistic paintings. For this commission, Reynolds painted members of the royal court of Europe during the designated time frame, including Edward VII, the Grand Duke of Russia, and King Ferdinand of Romania. His choice of characters and style of painting overall captured the antiquated grandeur of this world class hotel. Praise for Reynolds and this project can be seen through various artistic journals and magazines, as well as through his personal correspondence with Sarah Lee who was “…thrilled at the prospect of [his] beautiful paintings going up, up over Manhattan”. In addition to the Helmsley Palace Hotel, Reynolds worked as a freelance artist for a variety of other institutions. 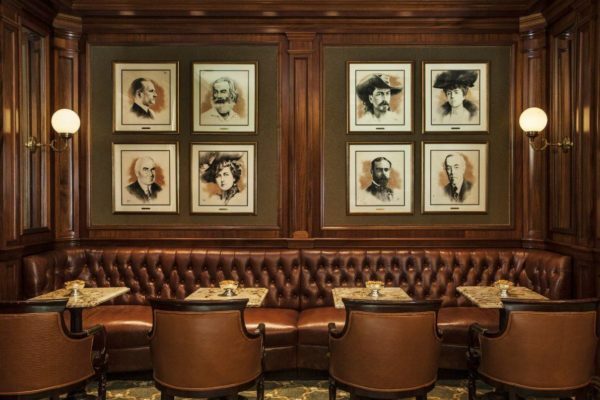 For the Round Robin Bar in the Willard Hotel in Washington D.C., he was commissioned to paint 16 portraits of famous guests, from Charles Dickens to Abraham Lincoln. He also painted portraits of fictional characters from The Late George Apley, a novel by John Marquand, for the Sheraton Boston Hotel. This novel was based on the life the fictional character George Apley, who was a member of Boston’s elite and lived his life by the traditional standards of upper class society during the 1930s. Through Reynolds paintings he captured the fictitious character’s proper and elite lifestyle mirrored in the design of the hotel, basing his portraits solely on the descriptions in the novel and his own imagination. While Reynolds completed a variety of paintings in different historical styles, he claimed that painting in the Edwardian style was his favorite. Although, he wasn’t just known for his portraits, as Interior Design magazine stated in 1981 that he was “…the finest painter of flowers in the world today,” in reference to his landscapes. 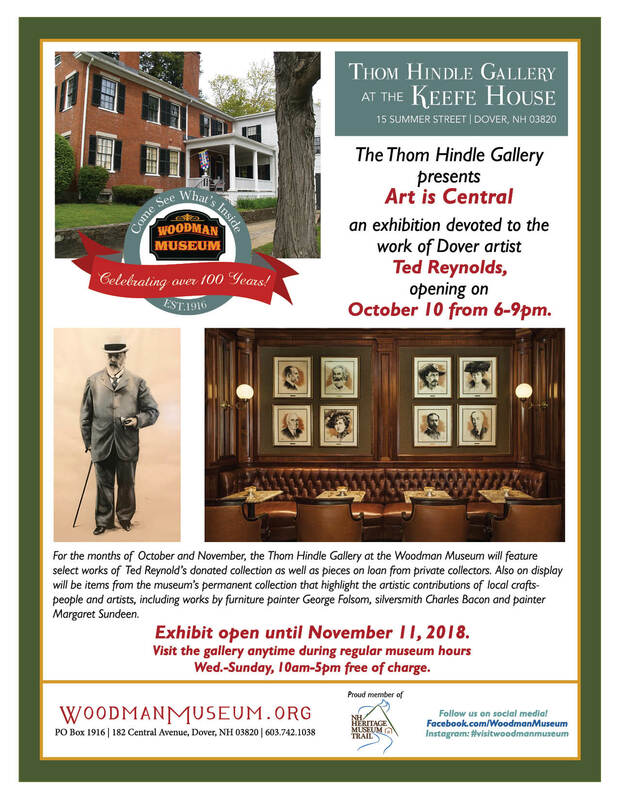 Reynolds may have worked as a nationally recognized freelance artist, but he did not ignore the New Hampshire community with which he resided. Beyond the art gallery he managed in Portsmouth, he completed various art pieces for the state itself. 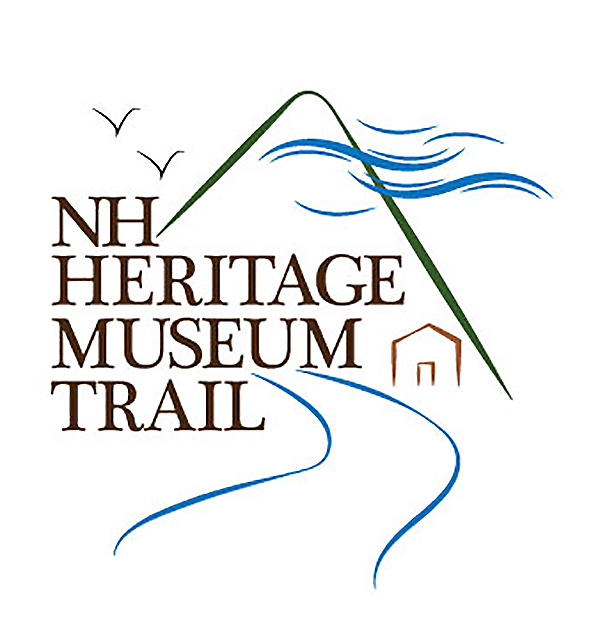 He completed a mural for Bow Lake, as well as a portrait of former New Hampshire governor Hugh Gallen, who sat for him. Ted Reynolds, a resident of the city until his death, serves as a proud reminder that Dover, a nearly 400-year-old community, continues to contribute to the narrative of arts and culture in the United States in contemporary times. The gallery will also feature art made by local Dover craft workers–who mostly worked along Central Avenue–including furniture painter George Folsom, silver by Charles Bacon, and paintings by Margaret Sundeen.